Warning: The following review features scantily clad schoolgirls and is recommended for readers aged 13 and up. You have been warned. So, dear readers, I have an unusual question for you. 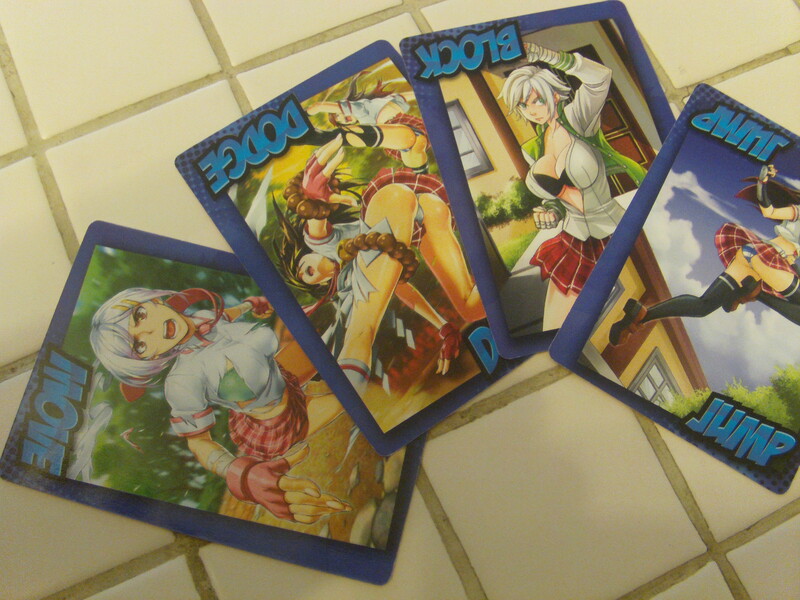 What do you get when you mix the classic card game Slapjack with mature-themed Japanese-style art? Well, you get Karate Fight! from Ninja Division and Soda Pop Miniatures. 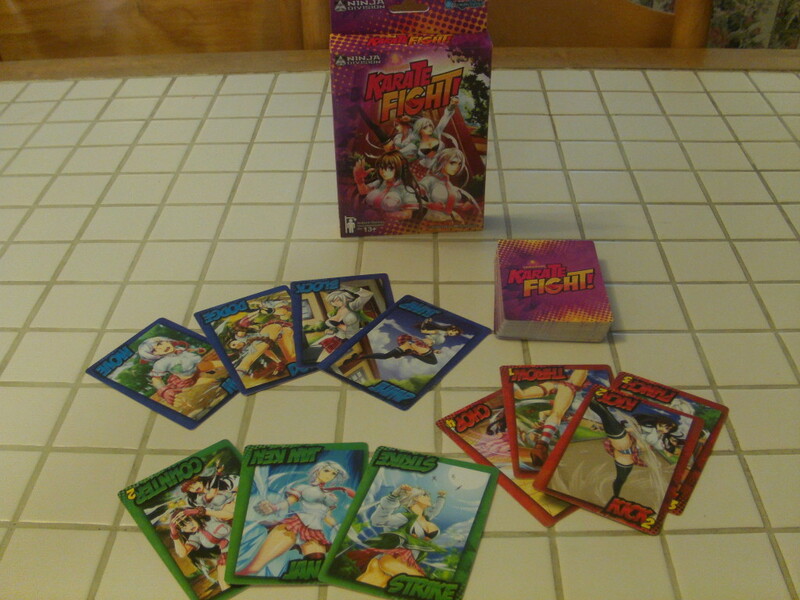 This fast-paced card game is for 2-4 players who enjoy looking at scantily clad schoolgirls and furiously slapping piles of cards. What do I mean by that? Well, at the start of the game, the deck of cards is divided equally amongst the players. A player will play the top card from their deck without looking at it prior and shout out the type of card it is. If it is an attack card (attack cards have a number on them), the next player will flip over cards from their own deck (up to that number) in an effort to play another attack card. If they succeed, the next player will flip over cards to find an attack card (and on and on and on.) If a player fails to play an attack card in response to an attack, then the player who initiated the attack upon them claims the pile of cards growing in the center of the table. 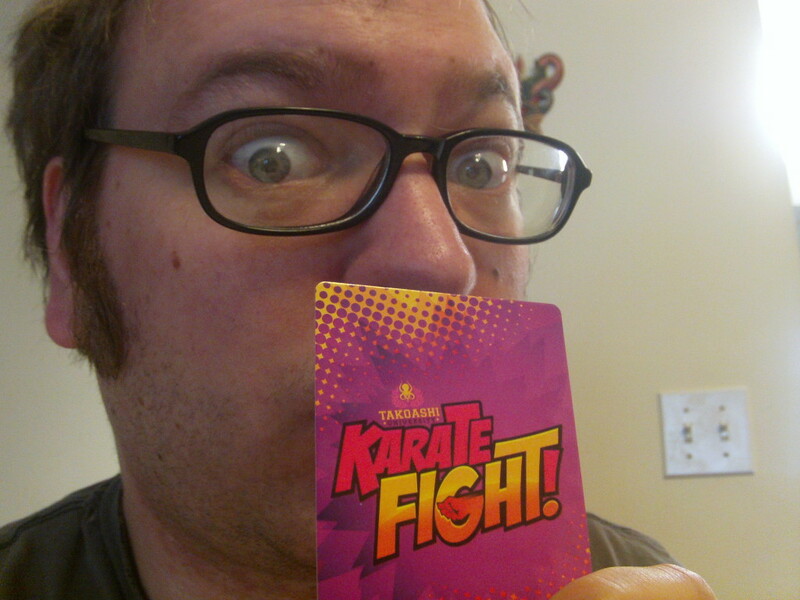 The first player to possess all the cards wins this particular karate bout. I can hear some of my savvier readers asking how slapping the table comes into play. Well, if certain cards are played in a particular order onto the central pile (such as two of the same defense card, or one of each of the four different defense cards, or a green Strike card, or three of the same attack card, or one of each of the four different attack cards) then any player may slap the stack of cards to claim the whole pile. If a player slaps the pile without it being legal (deemed a Coward’s Blow) then they must forfeit a card from the bottom of their deck to the central pile. In addition, there are two more cards that mix up play. First are the green Counter cards, which reverse the order of play around the table (much like the Reverse card in Uno). Simple enough, but then there is the green Jan Ken card. When this card is played, all players put down their decks and play a game of Jan Ken Poi! (This is a game of Rock, Paper, Scissors.) The winner gets to scoop up the pile of cards in the middle of the table. So, here’s the thing: Slapjack works as a game because it has a very simple concept. See a Jack? Slap the pile of cards before anyone else. It is easy to remember and doesn’t require much thinking. Karate Fight! on the other hand, has five different situations in which you can slap the cards. Combine this with the fact many of those situations are reliant upon a specific sequence of cards (which get covered up as cards are played) and you end up with a situation that can be very confusing for players. What’s more, all of these situations are detailed in the instructions, but that doesn’t really help each player as there are no player aide cards- no way for players to remind themselves as to what they can slap and what they can’t. Add on top of that the fact that whenever a player runs out of cards, they merely need to slap a pile to get back in the game, and you have a seemingly never-ending game in which people are unsure of what they’re doing or what’s going on. With table slapping. 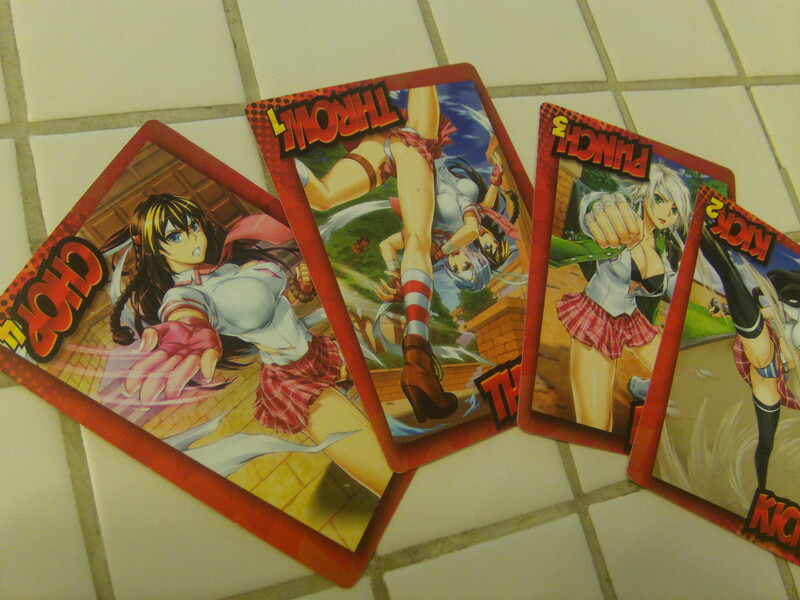 On the plus side, the card art is nice- if you’re into pictures of school girls with their underwear showing. However, we here at A Space Ahead need a little bit more from our games than some PG-13 T&A and we think that you, our dear readers, may as well. In the end, I find that Karate Fight! is an overly complicated take on a classic card game with some titillating art thrown in to draw some attention. If the card art is something that you really enjoy, go for it. Otherwise, you may be better off just getting a normal deck of playing cards and playing Slapjack.